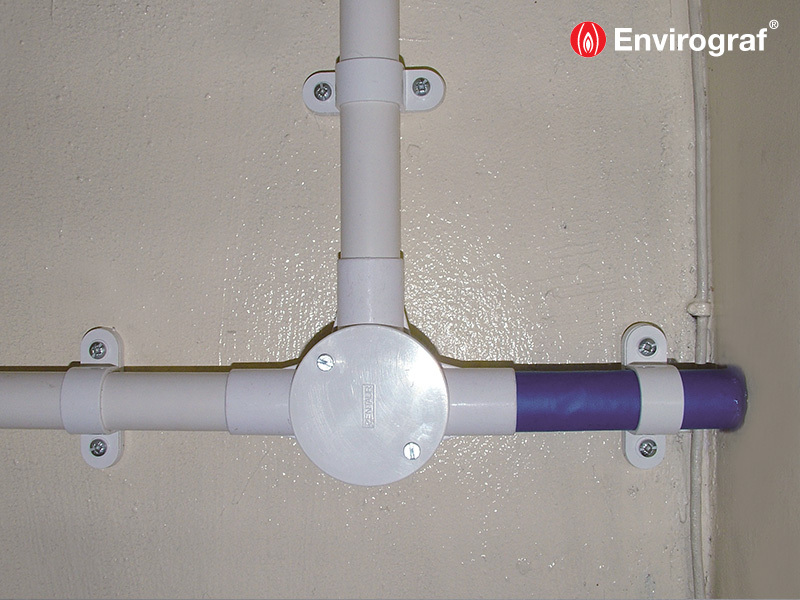 A fire resistant sleeve which fits tightly around electrical conduits passing through walls, floors and ceilings. Protrudes from the wall on both sides, protecting the entire length of the conduit inside the wall. Expands inwards in a fire and compresses the conduit to stop fire from spreading through it. wall or floor. The semi flexible tube can be cut and fitted around the cables etc. and adhered with the self-adhesive tag then pushed into the wall. The Intumescent Protection Sleeve System can be fitted over existing services and comes in 20mm and 25mm diameters to fit into sockets or BESA boxes. Complies with 17th Edition IEE Wiring Regulations, Document B of UK Building Regulations, and Regulatory Reform Order 2005. Tested to BS476 PART 22 (1987) giving 69 minutes integrity and insulation in hollow plasterboard/lath-and-plaster walls. Tested to EN1366-1 (2000) achieving 122 minutes integrity and insulation. Tested to EN1366-3 (2005) achieving 78 minutes integrity.